Also did some cleanup of the scene and noticed an interesting new feature in Maya 2011. I use render nodes in a lot of my rigs and I typically organize them using containers. 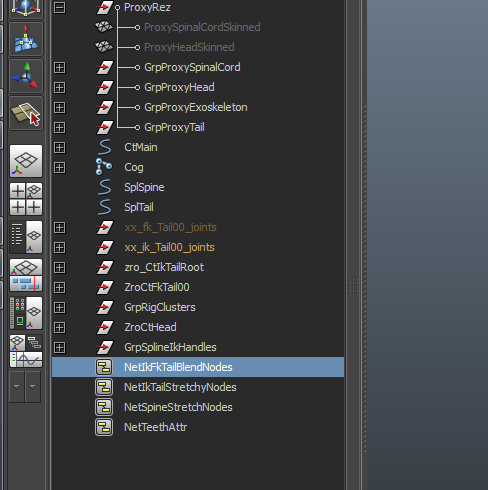 In Maya 2011, container objects are now displayed in the Outliner, as opposed to being accessible only in the hypershade with other render nodes. I’m not quite sure what to make it yet, but it is disconcerting that I now have another type of object to manually hide from animators. This entry was posted in Main, portfolio, tips and tutorials and tagged maya, portfolio, rigging, scorpion, tips, tricks, tutorial. Bookmark the permalink.